Ms. Yeo, Dr. Chau, Mr. Chi, and Dr. Ta are with the Department of Physical Medicine & Rehabilitation at Loma Linda University Health Department in Loma Linda, California. Mr. Ruckle is with Loma Linda University School of Medicine in Loma Linda, California. 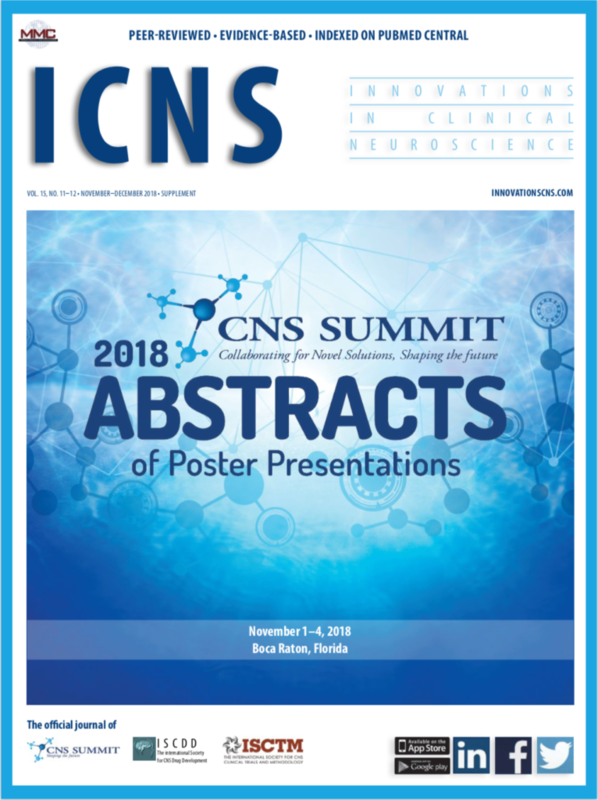 Abstract: Objective: The goal of this review was to evaluate the evidence regarding the use of virtual reality (VR) therapy for improvement of mobility in patients with spinal cord injury (SCI). 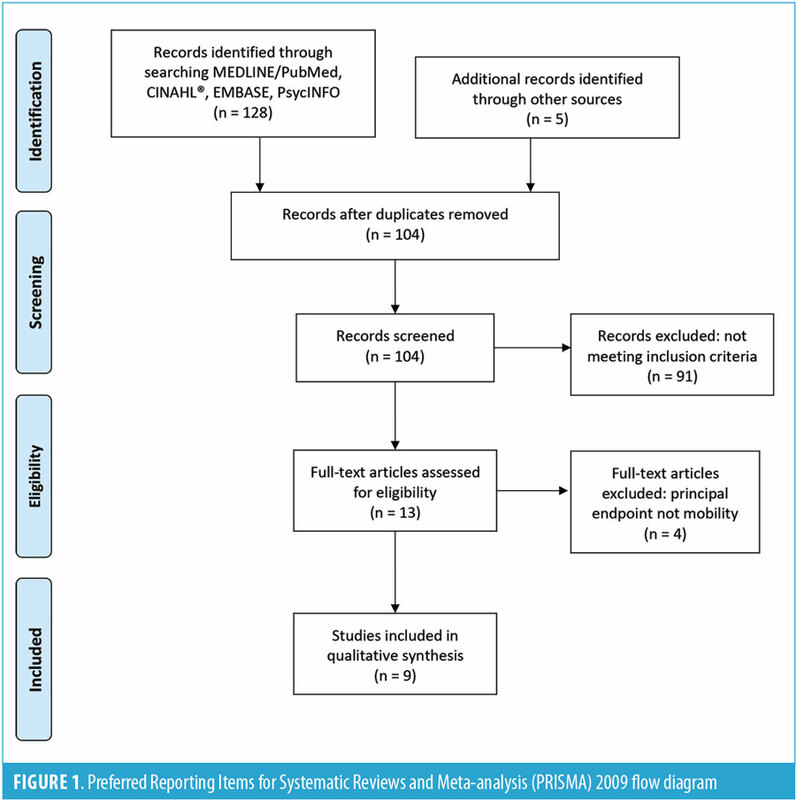 Methods: A comprehensive literature search was conducted utilizing PubMed, CINAHL, EMBASE, and PsycINFO databases in April 2018. The phrase “virtual reality” and a combination of “spinal cord injury,” “tetraplegia,” “quadriplegia,” or“paraplegia” were used as search terms. References included selected articles were reviewed as well. Articles were filtered based on the following inclusion criteria: 1) written in English, 2) peer-reviewed, 3) VR used for patients with SCI, and 4) changes in motor function evaluated. Main outcome measurements: Common outcomes of mobility assessment used in the studies included the Functional Reach Test (FRT), Functional Independence Measure (FIM), Limit of Stability (LOS), Berg Balance Scale (BBS), Timed Up and Go (TUG) test, and Walking Index for Spinal Cord Injury II (WISCI II) scale. Results: Seven of the nine reviewed articles were case series, while two were randomized, controlled trials. Reviewed literature demonstrated significant benefit in FRT, BBS, gait speed, muscle strength, SCIM, and WISCI-II using VR therapy. Voluntary muscle control improvement was also observed. However, no significant differences were found with regard to finehand motor movement. Conclusion: This literature review demonstrated mostly positive outcomes for the use of VR for SCI rehabilitation but were limited in quality and scope. Larger, multicenter trials are still needed. Virtual reality (VR) is the use of technology, such as a head-mounted display (HMD), tracking system, and sound device, to create an interactive three-dimensional (3D) experience. HMDs typically consist of a wearable display with two screens to project stereoscopic images of a three-dimensional computer modeled environment to the viewer. Each turn of the head or change in position relates to a synonymous translation of movement in the virtual setting. Other methods of creating an immersive environment in addition to the use of HMD include the use of large computer screens attached to the walls of the room, covering each facet of the user’s periphery to provide an encompassing virtual backdrop.5,6 The tracking system uses body-mounted accelerometers that connect the user’s movement in real life to the displayed movement in the virtual environment. Additional equipment to enhance the life-like experience play on other human sensations, such as sound and tactile response.5,6 Frequently, sound is connected to the user through earphones, while tactile responses are coupled to devices such as haptic-feedback gloves or wearable sleeves.5 Ultimately, the goal of the equipment is to create the most immersive experience possible. Previously, the cost of these VR systems limited their accessibility by the general public. However, VR technology is more affordable now with the improvement in technology. In addition, the functionality of VR has expanded from entertainment into healthcare. The ever-increasing capabilities for VR technology portend an innovative approach to treatment possibilities within the medical field, including management of psychiatric disorders (e.g., exposure therapy) and central nervous system (CNS) disorders (e.g., rehabilitation for phantom limb pain or following traumatic brain injury).9–12 While further research into long-term effects of VR rehabilitation are limited, creating a representative safe environment to practice mental and/or physical strategies mirrored in reality with the ease in interchangeability of environments generated by a computer system has vast implications in the future of medicine. The aim of this review is to evaluate and summarize the use of VR for the improvement of mobility in patients with SCI. A total of 133 articles were found using the search criteria. After excluding duplicates, 104 remained. Of those, 13 articles met inclusion criteria, but four were excluded based on exclusion criteria. Ultimately, this review analyzed nine studies that used VR for mobility rehabilitation in the SCI population. 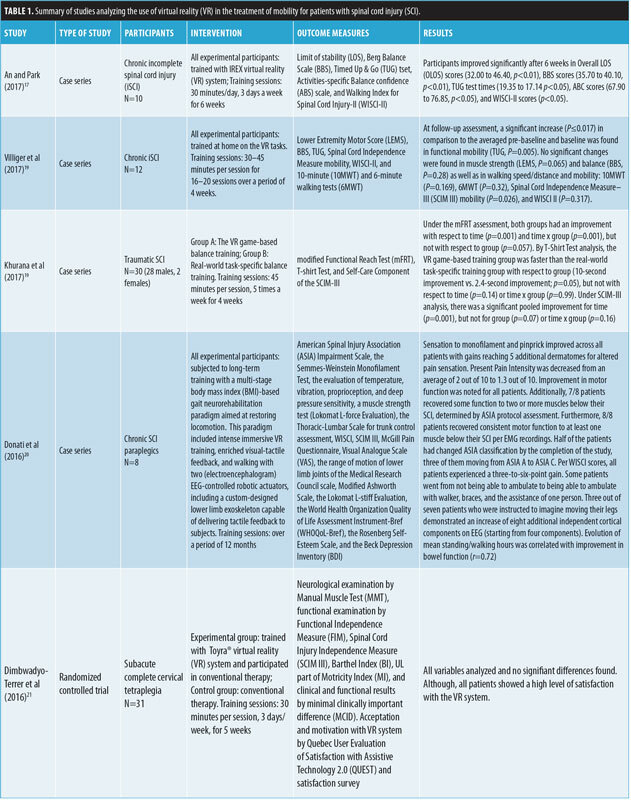 Seven of the nine articles were case series, while two were randomized, controlled trials.14,15 Table 1 summarizes the nine reviewed articles. Common outcomes of mobility assessment used in the articles include the Functional Reach Test (FRT), Functional Independence Measure, Limit of Stability (LOS), Berg Balance Scale (BBS), Timed Up and Go (TUG) test, and Walking Index for Spinal Cord Injury II (WISCI II) scale. Other outcomes assessing motivation, including Activities-Specific Balance Confidence (ABC) scale and a Short Feedback Questionnaire (SFQ), were used in some of the articles. Games used to facilitate mobility. In one of the first articles evaluating VR therapy in patients with SCI, Kizony et al16 used VR games to improve changes in mobility. Comparable to Kizony et al, An and Park,17 Wall et al,18 and Khurana et al19 also assessed for changes in mobility through gait and function in patients with SCI using VR games. 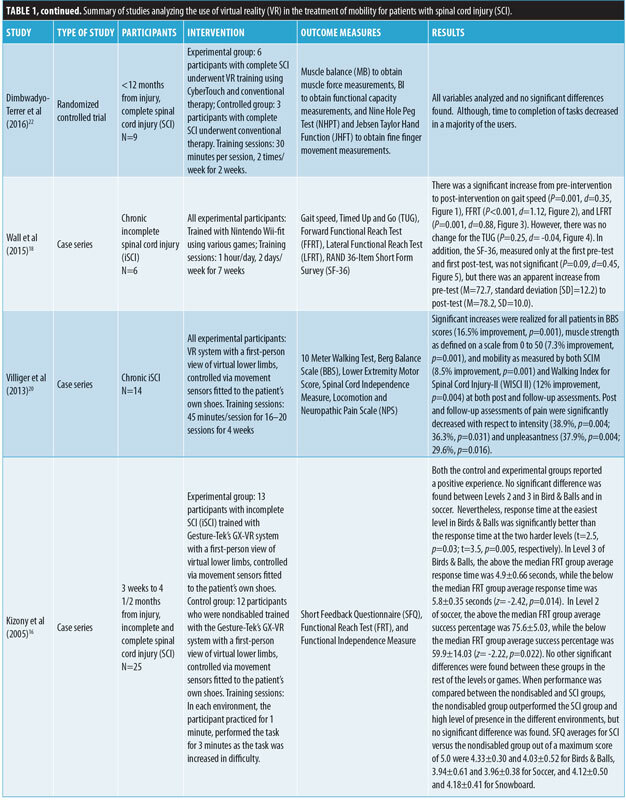 However, each of these articles differed in the type of VR headset used, the games chosen to assess progress, and some of the tests used to evaluate changes in mobility. Fine hand movements. With hopes of improving fine hand movements, Dimbwadyo-Terrer et al23 used the VR system CyberGlove® (CyberGlove Systems Inc., San Jose, California), a glove placed around the user’s hand to provide tactile feedback sensation and record up to 22 joint angle measurements. The user’s hand movements translated to a virtual hand displayed on a liquid crystal display (LCD) screen. Users took part in three tasks involving reach and release of objects. In a similar study, Dimbwadyo-Terrer et al24 evaluated 31 tetraplegic patients with SCI using the Toyra VR therapy (Toyra, Alcobendas, Madrid), which captures and records real-time motions using sensors attached to the person’s body. Similarly, the tasks involved VR sessions in the form of interactive environments geared toward improving autonomy during ADLs, through display of an object and requirement of the subject to perform the motor action necessary to work said object. In both studies, the control group underwent only conventional therapy, which included ADL training, upper limb functional exercises, and physiotherapy sessions, while the experimental group underwent conventional therapy plus VR therapy. The aim of this review was to analyze the available published data on the use of VR for improvement of mobility in patients with SCI. In all studies, change in functional mobility was assessed. Of the nine articles using VR to treat patients with SCI, six reported significantly positive mobility outcomes, one reported limited change in mobility outcomes, and two reported no change in mobility outcomes after use of VR; in these latter two, the investigator did note the perceived effectiveness and satisfaction of patients were highly rated. Games used to facilitate mobility. Four articles evaluated use of VR games to improve balance and mobility in SCI patients.16–19 In all articles, the positive results in FRT, BBS scores, and gait speed time suggest VR might benefit overall change in mobility, most likely from practice of balance and mobility within the VR environment. These practices involved performing tasks concerning changes in center of gravity movements, such as avoiding obstacles and reaching for items below their waist level. By participating in games that require frequent weight shifting and bending of the body to reach objects, participants constantly performed balancing exercises necessary for postural stability. In addition, many games focused on avoiding obstacles requiring upright balance and motility. As participants progressed within the games, new skills were possibly integrated into motor patterns and adjusted to improve real-life function. These studies suggest VR games might be an alternative approach to advancement of balance and mobility in rehabilitation of patients with SCI due to the practice of movements used in real life that enhance balance. An and Park17 also demonstrated significant differences in pre- and post-intervention TUG test, suggesting VR games might improve upright mobility in patients with SCI. However, TUG scores in Wall et al18 did not show significant change, which might be due to the nature of the games played. All of the games through the Nintendo Wii Fit required balance and adaptability. However, most of the games did not involve moving from a sitting to a standing position. Once again, skills practiced in the VR setting seemed to improve skills needed in real life. Thus, possibly since motions required for the TUG test were never practiced within the VR therapy, no significant improvement was found in the TUG test. Lower limb mobility. In Villiger et al,20,21 significant improvements were found in BBS scores, muscle strength, SCIM, and WISCI-II. Like prior studies using VR games to enhance treatment, this study demonstrated improvement in variety of lower limb functions including strength, stability, and functional mobility. While muscle strength alone does not necessarily correlate with walking ability, the overall improvements in several aspects related to mobility support the concept that VR rehabilitation might demonstrate efficacy in overall walking ability. The motivation of patients to perform rehabilitation exercises is a critical component of therapy.25–28 In Villiger et al,20,21 VR therapy was shown to be a motivating factor. In Villiger et al,20 participants underwent hundreds of similar movements during each training session, with reported high levels of enjoyment. Thus, VR therapy might be an alternatively engaging way for patients to undergo rehabilitation. BMI gait protocol for walking. Unlike prior studies, Donati et al22 used a BMI-based gait protocol and reported significant improvement in tactile sensation, proprioception, vibration, and nociception among all eight patients. Improvement in voluntary muscle control was also observed, allowing three participants to be reclassified from ASIA A to C and one from ASIA B to C. This study demonstrates the potential efficacy of visualization in both the improvement of sensory and motor function. While this study exhibited promising results, the lack of a control group tempers the authors’ conclusions. Fine hand movements. To measure changes in fine hand movements, Dimbwadyo-Terrer et al23,24 evaluated patients using a CyberGlove in one study and the Toyra VR system in another study. In both studies, no significant differences were observed in any of the analyzed variables. The lack of significant differences in these studies could be due to the uniqueness of the methods. The time period in which participants underwent therapy might not have been long enough to show significant changes. Although other studies were able to show significant differences in mobility, this study differed in that the investigators were attempting to find significant differences between two groups, both of which were undergoing some form of therapy. To observe significant improvements in these groups, longer durations of sessions might be needed. Interestingly, An and Park17 also measured confidence in balance using the ABC scale and found scores significantly improved. Because many patients are limited by fear of falling during rehabilitation, patients might demonstrate reluctance to perform therapies necessary for improvement.30 However, significantly increased confidence levels might translate to improved interest and participation levels in therapy. In Wall et al,18 while patients reported ability to complete more tasks at home due to improved balance following VR rehabilitation, the SF-36 did not demonstrate significant improvement. This discrepancy could be explained by the inability of the SF-36 to record minute improvements in confidence within the individual. Although these changes might seem insignificant, confidence can provide motivation for rehabilitation. In addition to functional mobility, Villiger et al20 and Dimbwadyo-Terrer et al24 assessed other outcomes. Participants rated effectiveness and satisfaction greater than 80 percent and enjoyment, motivation, and attention greater than 85 percent, respectively. Because functional mobility is highly dependent on motivation,25,29 positive attitudes toward VR is important in fostering a supportive environment in which patients feel motivated to engage in their rehabilitation. Along with the benefits of improving motivation through VR games, VR therapy has the option of providing regimented treatment programs suited toward the individual needs of each patient. Various games offer different levels of difficulty, a measurable outcome, and depending on ability, levels can be chosen to match the capabilities of the patient. As patients improve in mobility, treatment programs can evolve by increasing the level of difficulty. Engagement promoted by competitive nature of these VR therapy games might foster better patient participation in therapy. The progress of patients also can be tracked with ease throughout the program in a quantitative manner. The ability to visualize progress might be a motivating factor in itself for patients. Additionally, computerized systems allow participants to compare progress and scores among each other and encourage friendly competition. Ultimately, VR therapy games might provide a more entertaining approach to therapy that can encourage consistent participation compared to conventional therapy. Side effects. A reported side effect of VR therapy is nausea caused by the disorientation of visual movements in a virtual experience.31 However, in the articles we reviewed, the lack of reported nausea and vomiting by participants in Kizony et al16 and An and Park17 studies suggests this side effect might not be an issue among patients with SCI. Furthermore, in Kizony et al,16 users reported no additional side effects that were not already experienced in conventional therapy. No other adverse events were reported in any of the articles we analyzed. Limitations. Although outcomes were similar in some of the studies, the type of VR and protocol used varied vastly among reviewed articles. In addition, while many studies had generally positive findings, additional studies using randomized controlled trial methodology are needed. Only 2 of the 9 studies enrolled 20 or more participants, revealing the limitation of small sample size. Furthermore, the diversity of participants in type of injury, time from injury, level of injury, and classification of injury largely hinders the generalizability of the studies. While quality of evidence supporting use of VR in SCI rehabilitation remains low, the existing data suggest promising results. Overall, the evaluated data demonstrated mostly positive outcomes for the use of VR in SCI rehabilitation but were limited in quality and scope. Larger, better-designed trials are needed to support use of VR as a definitive method of treatment for SCI. 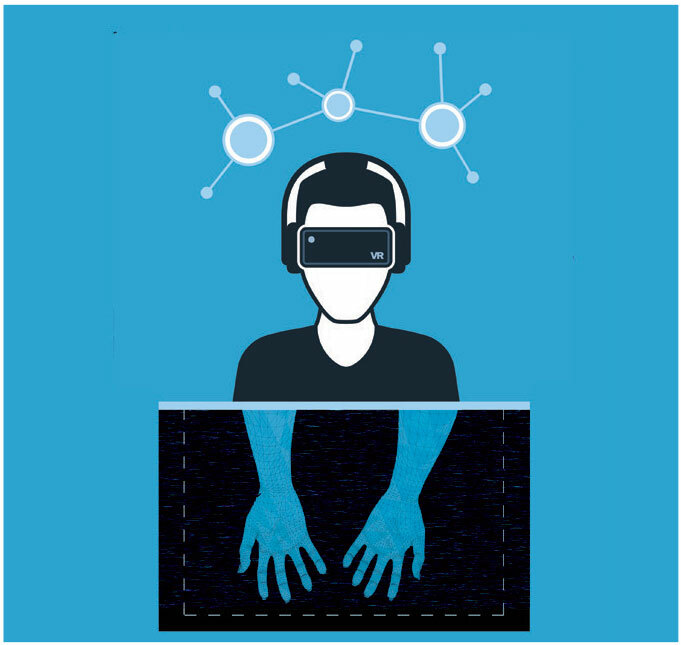 With the decrease in costs and increased availability of technology to the general public, VR is conceivably a prospective option for rehabilitation in the SCI population. We would like to thank the Loma Linda University Health Department of Physical Medicine and Rehabilitation for their support. Armour BS, Courtney-Long EA, Fox MH, et al. Prevalence and causes of paralysis—United States, 2013. Am J Public Health. 2016;106(10):1855–1857. Trgovcevic S, Milicevic M, Nedovic G, Jovanic G. Health condition and quality of life in persons with spinal cord injury. Iran J Public Health. 2014;43(9):1229–1238. Ahuja CS, Nori S, Tetreault L, et al. Traumatic spinal cord injury—repair and regeneration. Neurosurgery. 2017;80(3S):S9–S22. Schultheis MT, Rizzo AA. The application of virtual reality technology in rehabilitation. Rehabil Psychol. 2001;46(3):296–311. Baus O, Bouchard S. Moving from virtual reality exposure-based therapy to augmented reality exposure-based therapy: a review. Front Hum Neurosci. 2014;8:112. Ma M, Zheng H. Virtual reality and serious games in healthcare. In: Brahnam S, Jain LC (eds). Advanced Computational Intelligence Paradigms in Healthcare 6. Virtual Reality in Psychotherapy, Rehabilitation, and Assessment. Berlin: Springer Berlin Heidelberg; 2011:169–192. Diemer J, Mühlberger A, Pauli P, Zwanzger P. Virtual reality exposure in anxiety disorders: Impact on psychophysiological reactivity. World J Biol Psychiatry. 2014;15(6):427–442. Sveistrup H. Motor rehabilitation using virtual reality. J Neuroeng Rehabil. 2004;1(1):10. Moher D, Liberati A, Tetzlaff J, Altman DG, The PRISMA Group. Preferred reporting items for systematic reviews and meta-analyses: The PRISMA Statement. PLoS Med. 2009;6(7): e1000097. Bernstein J. Evidence-based medicine. J Am Acad Orthop Surg. 2004;12(2):80–88. Burns PB, Rohrich RJ, Chung KC. The levels of evidence and their role in evidence-based medicine. Plast Reconstr Surg. 2011;128(1):305–310. Kizony R, Raz L, Katz N, et al. Video-capture virtual reality system for patients with paraplegic spinal cord injury. J Rehabil Res Dev. 2005;42(5):595–608. An CM, Park YH. The effects of semi-immersive virtual reality therapy on standing balance and upright mobility function in individuals with chronic incomplete spinal cord injury: a preliminary study. J Spinal Cord Med. 2018;41(2):223-229. Wall T, Feinn R, Chui K, Cheng MS. The effects of the Nintendo™ Wii Fit on gait, balance, and quality of life in individuals with incomplete spinal cord injury. J Spinal Cord Med. 2015;38(6):777–783. Khurana M, Walia S, Noohu MM. Study on the effectiveness of virtual reality game-based training on balance and functional performance in individuals with paraplegia. Top Spinal Cord Inj Rehabil. 2017;23(3):263–270. Villiger M, Bohli D, Kiper D, et al. Virtual reality-augmented neurorehabilitation improves motor function and reduces neuropathic pain in patients with incomplete spinal cord injury. Neurorehabil Neural Repair. 2013;27(8):675–683. Villiger M, Liviero J, Awai L, et al. Home-based virtual reality-augmented training improves lower limb muscle strength, balance, and functional mobility following chronic incomplete spinal cord injury. Front Neurol. 2017;8(635). Donati AR, Shokur S, Morya E, et al. Long-term training with a brain-machine interface-based gait protocol induces partial neurological recovery in paraplegic patients. Sci Rep. 2016;6:30383. Dimbwadyo-Terrer I, Trincado-Alonso F, de Los Reyes-Guzman A, et al. Upper limb rehabilitation after spinal cord injury: a treatment based on a data glove and an immersive virtual reality environment. Disabil Rehabil Assist Technol. 2016;11(6):462–467. Dimbwadyo-Terrer I, Gil-Agudo A, Segura-Fragoso A, et al. Effectiveness of the virtual reality system toyra on upper limb function in people with tetraplegia: a pilot randomized clinical trial. BioMed Res Int. 2016;2016:6397828. Maclean N, Pound P. A critical review of the concept of patient motivation in the literature on physical rehabilitation. Soc Sci Med. 2000;50(4):495–506. Kubie LS. Motivation and rehabilitation. Psychiatry. 1945;8(1):69–78. Siegert RJ, Taylor WJ. Theoretical aspects of goal-setting and motivation in rehabilitation. Disabil Rehabil. 2004;26(1):1–8. Maclean N, Pound P, Wolfe C, Rudd A. Qualitative analysis of stroke patients’ motivation for rehabilitation. BMJ. 2000;321(7268):1051–1054. Paton H. Increasing motivation for physical rehabilitation: a brief psychological intervention. Clinical Psychologist. 2003;7(2):121–124. Legters K. Fear of falling. Phys. Ther. 2002;82:264–272. Rebenitsch L, Owen C. Review on cybersickness in applications and visual displays. Virtual Reality. 2016;20(2).